1.1 Where did the writers come up with the names used on TAGS? 1.2 Who was the announcer at the beginning of the show that said, "The Andy Griffith Show...staring, Andy Griffith....with Ronny Howard. Also starring, Don Knotts? 1.3 I have a tape that starts out saying "Andy of Mayberry" instead of "The Andy Griffith Show". Why the name change? 1.4 Regis uses the phrase "worshipers of Mammon". Anyone know the history of that reference? 1.5 Do you know in what episode a dart board was hanging from the bulletin board? It was only shown once. 1.6 I was wondering if you know the name of the painting that hangs over the Taylor fireplace in many of the episodes of TACS (it s a farmer in a field)? 1.7 Can you get a blue and gold sleeve patch like the one's Andy & Barney had on their uniforms anywhere? 1.8 Who was the first female that wore pants on TAGS? 1.9 Watching quiet Sam plant his fields at night, did I hear Barney make a suggestion that maybe Sam's planting a little "happy weed," or marijuana. Did I hear Right? 1.10 How many times did TAGS made the cover of TV Guide? 1.11 I was looking at the map in the courthouse, and somewhere it was said on the TAGS site, that it was upside down..How can you tell? I could barely see it. 1.12 Are there any animated TAGS characters out there? 1.13 Well, nobody came up with the answer to the extry-tough trivia question I posed the other day (the one about voices being heard in the background before the words were spoken aloud), so here is the long-awaited answer. 1.14 I thought of five people who appeared on both TAGS and Star Trek: Elinor Donahue, Clint Howard, Michael Pollard, Teri Garr, and the man who played Mr Atoz on the Star Trek. Can anyone think of anyone else who was on both? 1.15 Was The Andy Griffith Show the first TV spinoff? 1.16 I will often see people sign off with "Abisinnia" (sp) and I remember Opie saying this in "Barney's Sidecar", but I have never understood what was meant by it? 1.17 In the opening scene where Andy and Opie are walking down the path by the lake, didn't we use to see the rock hit the water? 1.18 Was Vietnam ever mentioned? 1.19 Where there any collectors plates based on Mayberry? 1.20 Did it ever rain in Mayberry? 1.21 I was watching an episode and I thought I saw Lucy on the magazine rack in Walkers Drug Store. Was it Lucy? 1.22 Was the fireplace in the Taylor home ever used in any episode? 1.23 Can someone tell me how many married couples were actually shown on TAGS? I can't think of that many. 1.24 In the title Mayberry, R.F.D., what does RFD stand for? 1.25 Thelma Lou had to go to Mt. Pilot to get her teeth fixed. Were there any dentists in Mayberry? 1.26 Could any good neighbor tell me what the rhymn is that the boys recite when they are eating apples that they stole with that new Quincy boy? 1.27 In Return to Mayberry when Barney was posting the warning sign for the monster in Meyers Lake, he said it was posted by Richard Kelly. Was that in reference to Richard Kelly the author? 1.28 How many public domain episodes of TAGS exist? 1.29 How many people appeared in both TAGS and The Brady Bunch? An unusual piece of trivia was supplied by Paul Gerefi of Fort Lauderdale, FL. He observed that within a 30 mile radius of Andy's birthplace in Mt. Airy, NC, are the following towns: Lawsonville, Walkertown, Crumpler and Taylorsville. The names of such characters as Floyd Lawson, Ellie Walker, Helen Crump and Andy Taylor naturally come to mind. Is this simply coincidence? Who was the announcer at the beginning of the show that said, "The Andy Griffith Show...staring, Andy Griffith....with Ronny Howard. Also starring, Don Knotts? This answer avoided us for years but thanks to TAGS fan Dennis Hasty we now have an answer. The name of the announcer is Colin Male. He was a former radio announcer in Cincinnati who moved to Hollywood to be part of the motion picture business. Colin appeared in the TAGS episode where Andy and Helen are caught fishing without a licenses by the game warden (#140 "Andy and Helen Have Their Day") . Colin was the game warden. I have a tape that starts out saying "Andy of Mayberry" instead of "The Andy Griffith Show". Why the name change? During the original run of "The Andy Griffith Show," CBS began to show reruns of TAGS during the daytime hours. To reduce confusion they re-titled the show "Andy of Mayberry." When TAGS original run was over the titles were changed back but when VIACOM began looking for "uncut" episodes, some of the best ones still had the "Andy of Mayberry" title on them and the tape distributors didn't fix it. They sometimes show up on your local stations, too, so be on the lookout. Regis uses the phrase "worshipers of Mammon". Anyone know the history of that reference? The quote is from the episode A Black Day for Mayberry and it is a reference to the Bible Matthew 6:24 (KJV) - No man can serve two masters: for either he will hate the one, and love the other; or else he will hold to the one, and despise the other. You cannot serve God and mammon. Mammon is defined as "riches or wealth regarded as a source of evil or corruption." That's in episode #70, "Lawman Barney." Opie beats Andy in a game of darts, and then asks his Paw if he'd like to play for money. Andy says that would ruin Opie's amateur standing, which prompts Opie to ask what an "amateur" is. Andy explains that an amateur plays for fun, while a professional plays because he wants to get paid. Opie decides he wants to be a professional amateur. I was wondering if you know the name of the painting that hangs over the Taylor fireplace in many of the episodes of TACS (it s a farmer in a field)? It's called "The Angelus, 1859" by French artist Jean Francois Millet (1811875). A similar work by Millet is called "The Gleaners". Prints of these paintings were not uncommon in American house-holds during the first half of this century. Who was the first female that wore pants on TAGS? How many times did TAGS made the cover of TV Guide? I was looking at the map in the courthouse, and somewhere it was said on the TAGS site, that it was upside down..How can you tell? I could barely see it. There were actually several different maps used throughout the run of the series. In a couple of episodes, there are two maps hanging there. According to the book "Inside Mayberry," one of the maps was actually an upside-down map of the Idaho/Montana border, but I studied and studied that map and I couldn't make head nor tail out of it. Perhaps there's a distinctive river or lake on the map that identifies it? in front of the map in question. Map at the Courthouse Anyway, Dave narrowed the field of possibilities and then pinpointed an exact match. And the location is….Cincinnati, Ohio. You see, that's not Old Man Kelsey's Crick winding its way through the map in the Courthouse. It's the Ohio River. Not only have Dave and Marsha identified the city, but they've also tracked down a copy of the exact map that hangs in the Courthouse. It's a 1951 map of Cincinnati. Are there any animated TAGS characters out there? Andy Griffith played a cartoon version of himself for the Christmas cartoon "Frosty's Winter Wonderland." Don Knotts was actually in 2 Scooby Doo cartoons: "The Spooky Fog of Juneberry" and "Guess Who's Knott Coming to Dinner?" He also played a Barney-type character in a "Garfield and Friends" episode. In another Garfield episode, Jack Burns played a Warren Ferguson-like character (huh? yeah. huh? yeah. huh?) and in others, Howard Morris does the voices of characters who talk and act like Ernest T. Bass. Gomer Pyle appears in a Pinky and the Brain cartoon (the voice was not done by Jim Nabors, though.) Gomer was the guard at the secret Roswell "ufo" site. Now to my favorite cartoon, the Animaniacs! 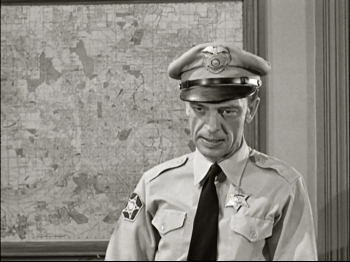 I have spotted Barney Fife in two episodes. One is "Three Tenors and You're Out" (Andy and Barney appear brifely on the big screen TV in Dodger Stadium) and the other is about TV censors (I can't remember the title). Atilla the Hun is chasing the Warners through the TV studio, and the guard at the front desk is Barney Fife. Don Knotts did not provide the voice, though. Well, nobody came up with the answer to the extry-tough trivia question I posed the other day (the one about voices being heard in the background before the words were spoken aloud), so here is the long-awaited answer. I thought of five people who appeared on both TAGS and Star Trek: Elinor Donahue, Clint Howard, Michael Pollard, Teri Garr, and the man who played Mr Atoz on the Star Trek. Can anyone think of anyone else who was on both? Kellie Flanagan as Claudia Campbell on TAGS and on the Star Trek episode "Miri" as "[| Blond Girl]"
Was The Andy Griffith Show the first TV spinoff? I will often see people sign off with "Abisinnia" (sp) and I remember Opie saying this in "Barney's Sidecar", but I have never understood what was meant by it? In the opening scene where Andy and Opie are walking down the path by the lake, didn't we use to see the rock hit the water? Where there any collectors plates based on Mayberry? Did it ever rain in Mayberry? I was watching an episode and I thought I saw Lucy on the magazine rack in Walkers Drug Store. Was it Lucy? Was the fireplace in the Taylor home ever used in any episode? Can someone tell me how many married couples were actually shown on TAGS? I can't think of that many. In the title Mayberry, R.F.D., what does RFD stand for? In 1896, the U.S. Congress approved Rural Free Delivery. People were becoming increasingly concerned taht a growing country needed to provide postal service to as many citizens as possible, and the villages of Charles Town, Halltown, and Uvilla, West Virginia were the "test markerts" for the project. Postmaster General William S. Bissel was outraged that Congress would charge him with such a ridiculous idea and he refused to spend the $20,000 appropriation stating it was clear that such a move would bankrupt the nation. Thelma Lou had to go to Mt. Pilot to get her teeth fixed. Were there any dentists in Mayberry? Mayberry did have at least one dentist. In "Ellie for Council," Otis' mother-in-law made an emergency visit to the dentist after Otis hit her in the mouth with a leg of lamb. Could any good neighbor tell me what the rhymn is that the boys recite when they are eating apples that they stole with that new Quincy boy? first person: "Apple core" second person: "Baltimore" first person: "Who's you friend?" ...and then the person named by the second person becomes the target for the apple core thrown by the first person. In Return to Mayberry when Barney was posting the warning sign for the monster in Meyers Lake, he said it was posted by Richard Kelly. Was that in reference to Richard Kelly the author? David Millard asked a question and quoted a line by Barney Fife in RETURN TO MAYBERRY wherein Barney gave thanks to a certain "Richard Kelly" for painting the warning sign about a monster in the lake...despite " painful arthitis in his knuckles." David, it was no coincidence. When the beloved Everett Greenbaum and I were writing "Return", Richard Kelly's name just happened to flash in my mind. I had met him and his charming wife Barbara when they came to Hollywood and visited me and my erstwhile partner Ray Allen at Twentieth Fox Studios where we were producer/writers on the LOVE BOAT series. Mr, Kelly (Acually DOCTOR Kelly he was a professor of English at the University of Tennessee)had become an enormous fan of TAGS when he was an undergraduate at Duke University. He had become known for his scholarly writings of the Victoria era, so a book on TAGS was quite a departure. However, it has enjoyed an enduring success. SERENDIPPPPPITY STRIKES! It so happened Bob Sweeney was on the lot directing a "Love Boat" episode. We nabbed him at lunch break and all revelled in swapping stories, a writer/director/critic symposium. It was great! I kept in touch sporarically with the Kelly's, but somehoiw didn't get around to telling them we had dropped his name into "Return." The first he knew was when he was watching "Return to Mayberry" on it's premiere showing..and suddenly up it popped...to his total surprise and delight. Admittedly a small thing, but it did serve as thanks to this most gifted, affable , honorable Mayberrian. How many public domain episodes of TAGS exist? There are no other episodes in public domain. How many people appeared in both TAGS and The Brady Bunch? Alan Melvin (Numerous episodes of each, best know as Alice's boyfriend Sam the Butcher). Hal Smith (Was in 2 episodes of TBB. One as a store Santa Claus and the other as the host of a kids show called Cartoon King). Burt Mustin (Played a man who wrote a book on Jesse James that came to the Bradys house to tell Bobby he was not a good guy). Mary Treen (Rose and other Mayberry ladies and played Alice's friend Kay who filled in for her when she stopped working for the Bradys in one episode). Herb V iagran (Bookie Barber and was in 2 epiodes of the Bradys as a store clerk and DMV test giver for Marcia). Robert Emhardt (Malcolm Tucker and Mr. Foster, played a judge in an episode of TBB). Jackie Coogan (Was the person suing Carol Brady in that same episode and also played a man who wouldn't sign a petition to save the neighborhood park). Steve Dunnel (Announcer when Barney comes back to town and dates Teena Andrews and was in 2 episoded of TBB, one as an old boyfriend of Alice and the other as host of the tv show that the kids sang on). J. Pat O'Malley (The man who tried to con Mrs. Mendlebright also played Carol Brady's father in the pilot episode). Dabbs Greer (The minister who married Mike and Carol, but like William Schallert, he was in EVERY tv show). Jay Novello (Attorney when Otis sues the county and jewel thief in Guest of Honor, played Peter Brady's boss when he worked at a bike shop). Russell Schulmam (Bully who picks on Mike Jones and also played a bully who fought Peter Brady). Hoke Howell (Original Dud played a gas station attendent when the Bradys went to The Grand Canyon). Ken Berry (Was in an episode where he and his wife adopted 3 boys of different races. It was a pilot that was never bought). Jackie Joseph (Played the head of the adoption agency in that episode). This page was last edited on 21 February 2017, at 00:43.